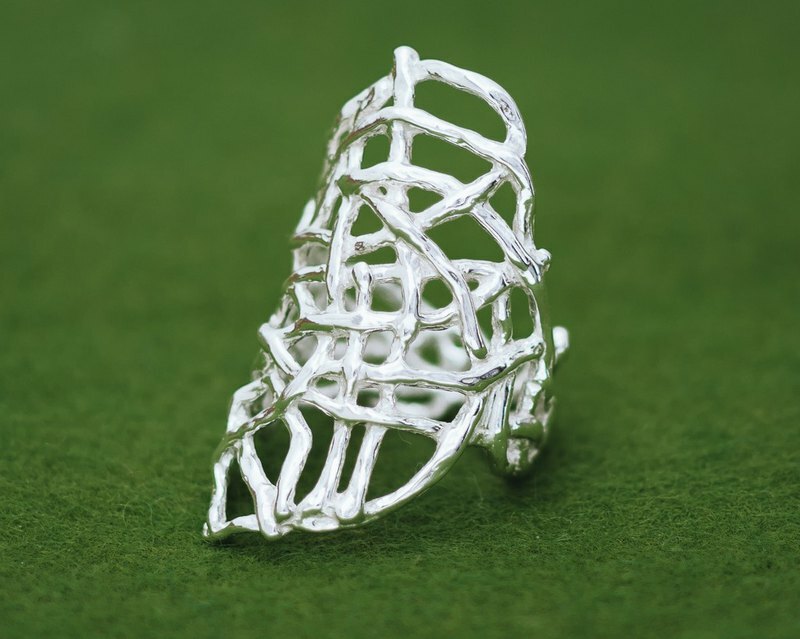 The Mesh ring has a maximum width of approximately 37mm. It sits flat on the finger yet it has great visually impact. The Mesh ring has a maximum width of approximately 37mm. It sits flat on the finger yet it has great visually impact. Although the design allows the ring to be adjusted in size, please specify your preferred ring size in the drop-down menu. Material: Britannia Silver 958 This piece is crafted with a base of Britannia Silver 958, a high purity silver which retains its bright color (unlike sterling silver which tarnishes easily). We provide a small zip lock bag in which we recommend to store your piece/s to keep them away from the air. This will help to keep them bright for a long time. ------------ We are a husband-wife, husband's-parents, and two-production-staff team. We make unique, handmade, original pieces in our workshop/store in Ginza Tokyo. Come visit our store if you're in lovely Tokyo. Thank you for looking!